I'm in the home stretch of writing an article about refrigerators, and have been learning about things like linear compressors, cyclopentane and medium-temperature glycol. Heady stuff, yes? 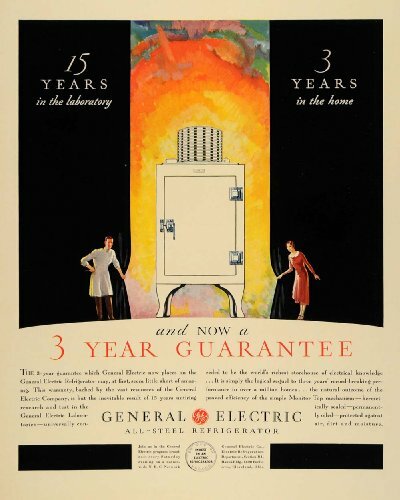 So I am especially appreciative of this 1931 advertisement that celebrates the science behind the humble [and might I add homely] fridge. The housewife and the lab technician drawing open the drapes of consumer ignorance to reveal the glorious Monitor Top, resplendent—and large—against a blazing backdrop that evokes nothing less than the Creation. And now back to dual-capillary energy valves. Sigh.